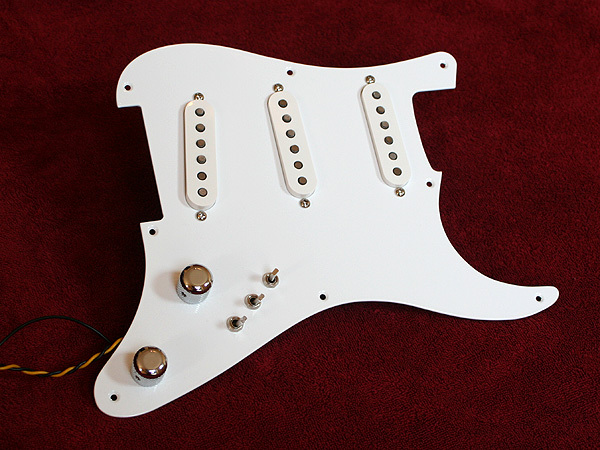 The family of the loaded Schecter-style pickguard – currently available in white aluminium and brass with tapped F500T-style pick-ups – got a new member: A pickguard with a pick-up configuration just like in Mark Knopfler’s red Schecter Strat in the early 80ies – thus the name Alchemy Edition. For now it is a really limited edition of just a few – so if this is what you always wanted better don’t wait too long ( I try but at the moment I cannot promise if I can make these availabe in the future again). The pick-ups are three Seymour Duncan SSL1 with white caps just like on Knopfler’s red Dream Machine (that’s the name for those Schecter Strats), everything else is as in the normal version. Note that these are non-tapped pick-ups which means those mini switches are on in the down position and off in the up and middle position (just like in Knopfler’s guitar). Update: The Alchemy Edition was a limited edition and is not available anymore. It was replaced by the loaded pickguard with the VFS-1 pickups. You can get the same sounds but in contrast to the Alchemy board – which only allowed 7 sounds – you do not lose the 26 different sound combinations from the three mini switches. 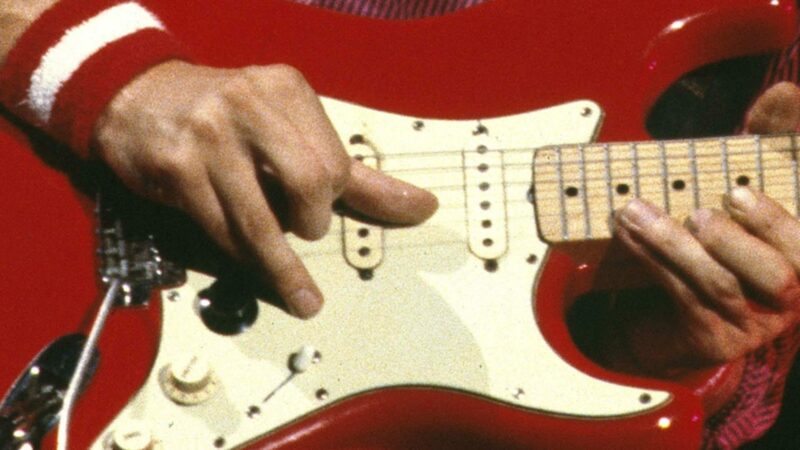 In the full coil position of the mini switch you will get a sound like the DiMarzio FS-1 that Mark had in his red Fender at the time of early Dire Straits so you will have the best of different worlds. Check out this blog post and the video there which compares the tapped coil sound of the VFS-1 ( stands for Vintage + Fat Strat) to an original 1955 vintage Strat pickup. WOW!!! A dream (machine!) come true thanks Ingo am saving up as we speak I hope you don’t run out!! Just a question (and really huge ammiration for the site,it’s fantastic)…did you ever tried the OZONE pickguards by Dave Schecter?I asked dave and he told me they are essentially the living legacy of the original F500T,but since i do not live in the US i never got a chance to try them..they are not very popular too,so maybe and expert might know the thing! Congrats again for the site! I haven’t tried these but the ozone pickguards seem to be very different from the vintage Schecter ones. They don’t have the mini toggle switches and the pickups have ceramic rod magnets. How do I get this exact pickguard,,, just the guard. Mine has a couple cracks in it.